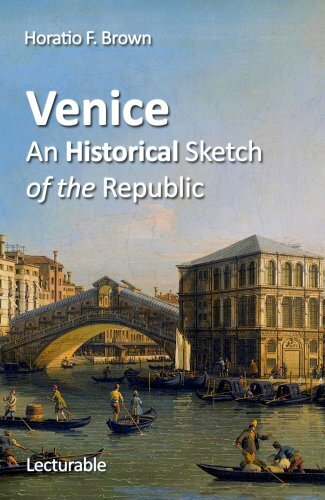 "In this volume I proposed to write a biography of Venice... Believing that a State is an organic whole, and that such an organism can be more easily studied in a City than in a Territorial State, it appeared to me that the Venetian Republic presented one of the most striking examples of the inception, birth, adolescence, decline, and death of a Community which history has to offer for our observation. Throughout her career the personality of the Republic overshadows the personality of even her most distinguished citizens. No State, except Athens, has ever presented, at the very core of her life, the idea of herself with such sumptuous personification in art. Athene in the Parthenon, Venezia in the Ducal Palace, offer the two most illustrious examples of a nation's self-portraiture through painting and through sculpture.